At Suncoast Pressure Cleaners we have a fully equipped workshop, complete with highly qualified service personnel. In or out of warranty, we can provide leading brand or import and aim to provide you with best service possible. At Suncoast Pressure Cleaners we recognise the importance of reliable equipment ready for work when you are. That’s why we have developed a “HASSLE FREE” servicing programme that will help keep your unit working when you are. We can offer you a genuine pressure cleaner servicing program that has been specifically designed to reduce the down time and breakdown costs of running Spitwater equipment in your organisation. We can arrange servicing so you don’t even have to think about when it was last done or ring to organise a service call. We will work out with you how often it should be done and we’ll be there to do the job. When the job is finished you will get a check list showing what was covered in the service and we will report on your units condition. We’ll tailor a package to suit each of your products individually so that you’ll be running your equipment as economically as possible without compromising quality. If you would like more information or want to organise for PREVENTATIVE MAINTENANCE Service, just give us a call on 5493 1105 or Email Info@suncoastpressurecleaners.com.au as we are always ready to help! We believe that it is imperative to have a service/spare parts sector second to none in order to get your machine back into use as quickly as possible. 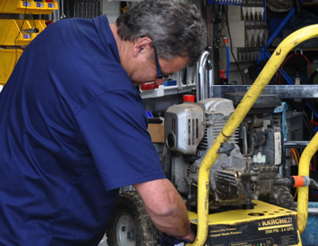 For this reason Suncoast Pressure Cleaners maintains an enormous assortment of spare parts where we have a dedicated Parts Manager and a Dispatch team to be able to fulfil our customer’s needs anywhere in Australia. In addition our fully trained technicians can provide technical advice over the phone. Call us on 07 5493 1105 to book your service.